While scrolling through Facebook one day, there was a postabout this beautiful Aztec sculpture from the 15th/16thcentury. This Double Headed Serpent became the inspiration behind mybelt. I used the gorgeous, turquoise scaled Regaliz leather forthe body of my serpent and Swarovski rivoli end caps for my heads. Before gluingon the end caps, I strung two charm holders onto the leather and attached a jumpringto the loop on each; this is where I connect the spring ring clasp for myclosure. The leather is a little bit hard to handle, just go with theleathers natural curve and it will create a bit of cross over under the clasp(as seen in the pictures below). And your belt is done!! Wonderfully paired with that littleblack dress for any occasion! Cubic Zirconia - 4 x 6 mm Emerald Cut Octagon - AAAAA White (1) - Discontinued - 70% off! Use with Metal Clay - these are fireable, or make a hole and mount after. Nice enough to use in metal smithing projects too. Swarovski Crystal Yarn - Cotton Yarn with Crystals - Cream /Crystal Golden Shadow (Metre) - Discontinued - 60% off! Now only $2.98 / metre. If the price of this frightened you off before, try it now. Cotton yard pre embellished with Swarovski Crystals. Add to another project or crochet with it? Glass Beads - 7 x 11 mm Pyramids - Ivory (12) - Discontinued - 60% off! Ivory is bad. But things that look like ivory are cool. And these fit the bill. Swarovski Neon Pearl - 12 mm Round Pearl (5810) - Neon Pink Pearl (10) - Discontinued - 60% off! Neon pearls - top quality and colour as vibrant as it comes - Fashion pearls from Swarovski in knock your socks off Neon colours! Resin Beads - 20 x 32 mm Crackle Gooseberries - Mint (1) - Discontinued - 30% off! Big, juicy, lightweight resin beads! Make something big but light! and so much more. Five pages of super deals! Don't wait! Click here now! Look out - its the low profile quad-copter beads! Well - no - it's Quadra Tiles - another multi-hole shaped bead for your beading delight! This is a low profile (that part is true), fairly thin square bead that you can use to link and stabilize your multi-shape-bead-creations. 19 new colours, and, I'm sure, more on the way. More colours in Pips too - Pastel Pips and Matte Pips. More of the soft, pretty colours that we are seeing in the rest of the shaped beads, so you can work in the same colour palette all the way. We're still doing some consolidating and re-org'ing in the store, so we have some deep, deep discounts on some stuff that we'd like to move out to make room for other goodies, (like so don't forget to stock up on these, as they are going for rock-bottom prices! Click on an image or link, or see all the new stuff in right here. Cheers! A friend of mine always has a visceral reaction to every stone she picks up: it feels hot, cold, etc. I don't have a reaction to stones through touch, so I don't understand it, but I do believe it works for many people. Humans have adored and adorned themselves with stones through the ages and have assigned them various meanings, whether as healing stones or birthstones. I react to stones through my eyes, deciding on what they mean to me intellectually, so I am more interested in what they make me feel when included in a design - their shape, colour, refraction and opacity excite me. As often happens to me, synchronicity brought several gemstone-related resources under my nose all at the same time this week, and it occurred to me that this blog would be a great place to round them up and create a one-stop reference for those of us who are enchanted by the lore, beauty and excitement of gems and stones. Earlier this week, Kate Richbourg posted a link to this long but very complete and easy to read article on how different treatments are applied to and affect gemstones. When you read it you will understand better how these treatments affect the quality and appearance of such things as pearls, coral, topaz and even diamonds. From coatings to dyes to foil backings, you will learn how gemstones can be manipulated and you will be an informed and more cautious buyer after reading this. Here is a link to this article. This morning, I watched a segment from Beads Baubles and Jewels that reviewed birthstones and included projects to showcase those stones. It's lots of fun to create thoughtful birthday presents for friends using birthstone gems. Molly Schaller also offers low cost alternatives to some of the semi-precious gemstones traditionally associated with some months. 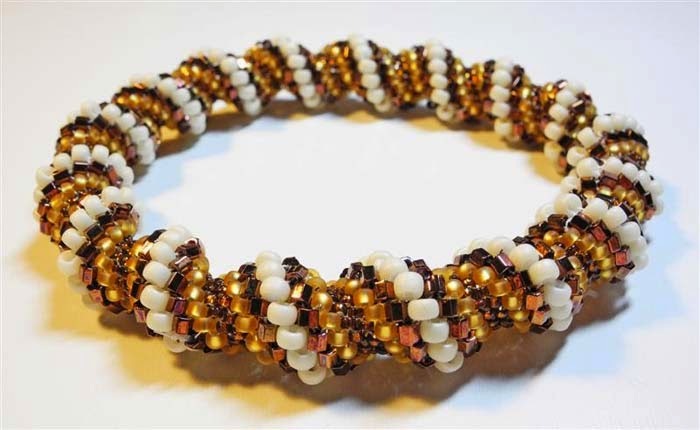 It's trendy again to wear stretchy bracelets featuring one or many different types of beads that are assigned certain healing powers. There are a lot of web pages reviewing the medicinal or healing qualities of crystals but often the information is wrapped in new age concepts and obscured by bad web page design/layout. So I went through quite a few references to bring you the best of them. This site offers a good and fairly complete alphabetical listing of the healing powers of gemstones. This online list of gemstones and their meanings is easy to read, is presented in alpha order and is accompanied by wonderful pictures of some stunning jewellery. This list is not as beautifully presented, but it is one of the most complete lists I've come across. 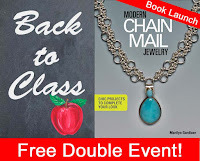 I've been making these simple and elegant gemstone necklaces with matching earrings, and now I'm inspired to add their gemstone stories to them for buyers. You can easily wire wrap gemstones and use jump rings to assemble the components into these simple pieces that require very little time to make yet carry a big impact. I think I'll wear my clear Quartz drop version today to take advantage of the clarity of thought they bring as they unblock my body and allow energy to flow through me. For the second year in a row, we are holding our special Back to Class event where you can come in and see for yourself the wonderful class projects that our instructors have developed and are ready to teach. 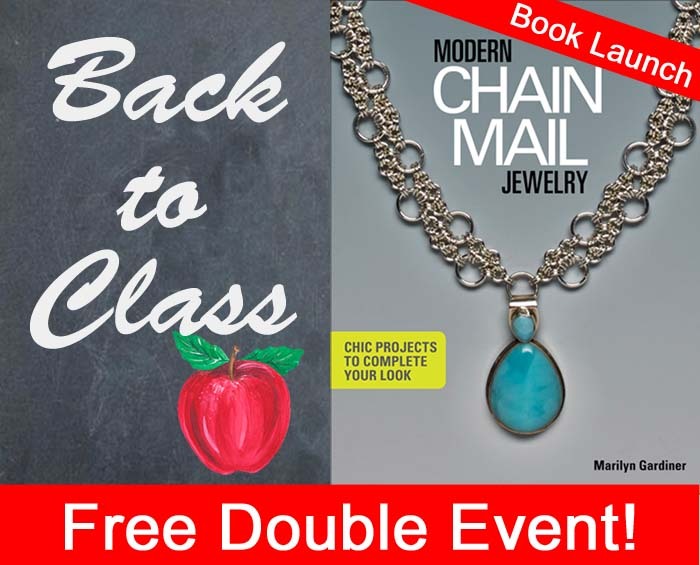 As an added bonus, we are also holding a Book Launch to celebrate Marilyn Gardiner's new book, Modern Chain Mail Jewellery! Mark your calendars now and join us! Prizes, draws and refreshments! To see all planned fun for the day, click on 'Classes' on our website and follow the links to September 12. New classes during the first half of September include two classes with Marilyn Gardiner directly from her new book! 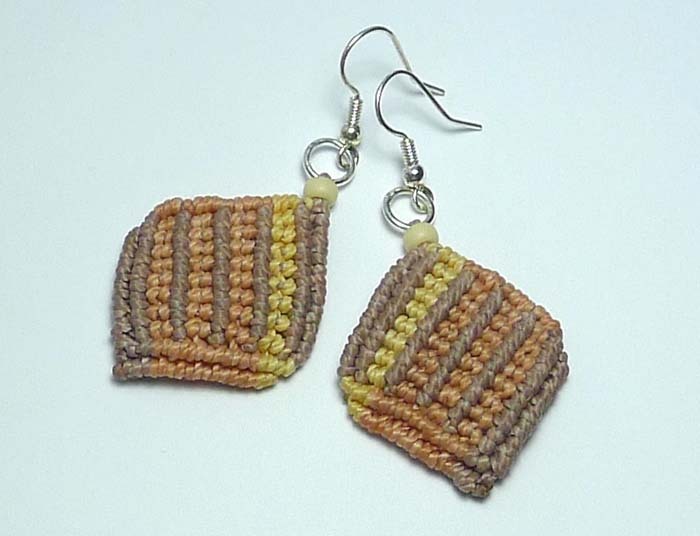 Pamela Kearns is teaching how to do the brick stitch to create a pair of fun and festive earrings. 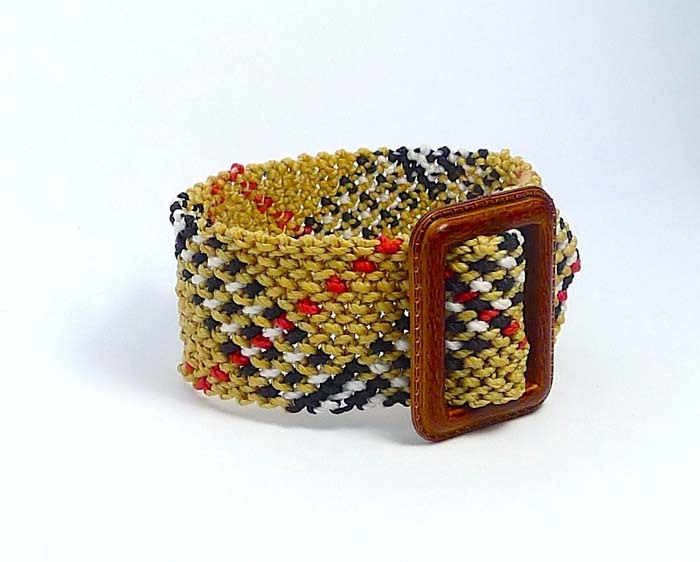 Angela Peace takes Cavandoli knotting to new heights with a colourful wristband/bracelet. A quick reminder that Jill Wiseman is coming later in September - don't be disappointed, reserve your space in her classes today! We have encore classes too from Bonni Poch and Kelly Garland! For complete information about the classes, including course descriptions, class and kit fees, click 'Classes' on our website and follow the link to the September calendar. BeadFX is proud to offer these FREE sessions. In return we ask that you use please our merchandise in our facility. Thank you. What is the most important thing in your craft show booth? And as your best sales tool for success it’s necessary to look after yourself. Sometimes we get so caught up in making sure we have all our display and product that we forget about us. don’t get hangry! Sometimes food isn’t readily available or you’re just too busy to go and get some. (or there is only crap food available). this is not the time for those super cute but not super comfortable sandals. You will be standing for 10 hours. 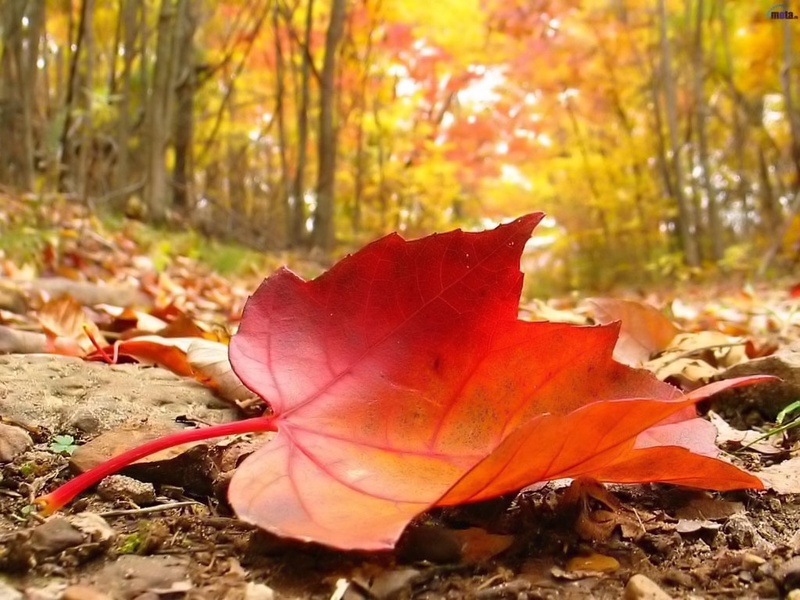 outdoor weather is fickle, and sometimes indoors is no better. If you are cold you will hunch your shoulders and shiver. This is not inviting body language. you need to be comfortable. Bring a sweater, a jacket, a tank top (in case it gets hot), leggings (can go under a skirt). Whatever you could possibly need. always take a photo of your display to go over later. I also snap photos of anything that catches my fancy like other peoples displays. I also use my camera phone to update my social media on the fly. hey, did you know that duct tape now comes in a variety of colours as well as transparent? even if you have mirrors on your walls, there will be people who are too short or too tall, or in a wheel chair. Hand mirrors are also a really great distraction for whiny children to play with, giving their mothers a few moments to shop. work out your prices with tax included. Figure out what your most popular price is and how much change you’ll need. 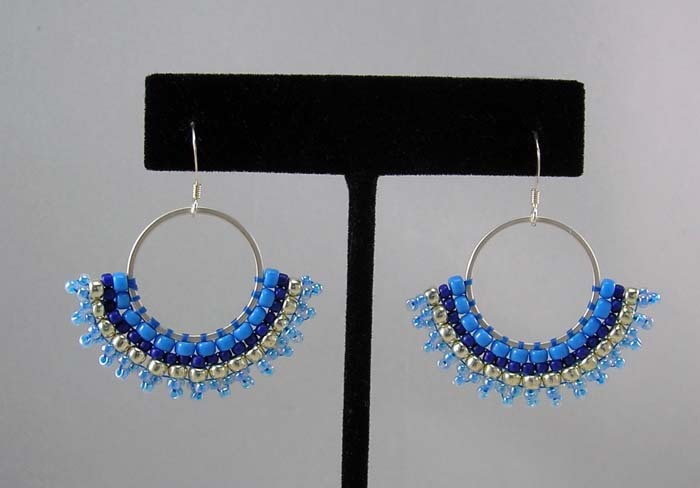 Most of my earrings are $35, with tax $39.55, I bring a LOT of quarters and dimes. all those brilliant ideas that flit through your brain, write them down. And if you have a bit of downtime, rather than checking out your phone (bad show behaviour), why not brainstorm a bit? no not for your work. A hammer, pliers, utility knife, screwdriver set, s-hooks, cable ties, all the fun stuff. no matter how many times you tell people not to try on the earrings, someone will not listen. OK, now you’ll be in excellent shape, now you can concentrate on rocking your sales. If you could capture a walk along a tropical beach in a necklace, would this be it? Sparkling waters in various shades of blue. A few sand dollars. A few marine plants or glimpses of marine critters. And silver sand glinting in the sun. This is a simple necklace where each beaded component is closed with wrapped loops, and then linked together with the jump rings. The join of the two strands is linked with two jump rings for a bit of added durability. Make this as many strands, or as long or short as you like! Time to clear away some stuff and make room for more great stuff. Like spring cleaning. Only in August. You have to check out our "Disco" section - that's Discounted and Discontinued - not a tribute to that 70's dance movement. Ick. We have stuff deeply discounted - too juicy to list in detail: Cubic Zirconia - now 70% off; Felting Tools - now 60% off; Lost Wax Carving Supplies - 70% off; Villas, Gumdrops, Pyramids, Spikes; Neon Pearls; Lycra Ribbon; Lucite Chain, and more! So come and check it out and see what calls your name! At these prices - you can afford to be adventuresome! So let's keep it short and sweet and I'll try not to make too many cough-syrup-induced mistakes. First up - more Ripple Beads. Though you might think there is a lot of duplication here - honestly - the colours are different. We added a bunch of the "pastel" colours - which is a slightly pearly, ceylon-like finish, and the silk matte colours - which are remarkably like candies in appearance. C'mon - tell me that is NOT the exact colour of candy chicks - aka "peeps." And for those of you waffling about whether or not to get some of these - we put together some mixes - so you can try more than one colour. Speaking of mixes - a few more of our luscious hand-made custom mixes. This one, Dwyn's Pick, is my fave - filled with ivories and blue and turquoise and picasso finish - all the ones I like. I swear - I made this long before I got sick. The More Purple is a good one too - Purple and gold lustre spikes, daggers and flowers, with "magic" finish seedbeads. And in the theme of purple, we also have Plums n Peaches. And for those fans of the "Magic" double coating - we have a mixed pack of size 6/0 Czech seed beads in Magic Iris, Magic Orchid, Magic Blueberry, and more. And, in utter defiance of the weather - Snow Business, which has a snowy polar heart so large, that we had to package these in bags instead of tubes. And lastly for this week - if you are jonesing for more colours of Toho 6/0s, we have 25 new colours, from Gold Lustred Hydrangea to Metallic Iris Purple. OK - that's it for this week. We're doing some consolidating and re-org'ing in the store, so we have some deep, deep discounts on some stuff that we'd like to move out to make room for other goodies, so don't forget to stock up on these, as they are going for rock-bottom prices! Click on an image or link, or see all the new stuff in right here. Cheers! Well, on one of the hottest days of the year, I think it's appropriate to talk about cold connections! Cold connections join metal without the use of flame/heat. This includes such techniques as: tabs and hinges; grommets, eyelets and tube rivets; brads and nails; various glues and epoxies; and wire, including wirewrapping. 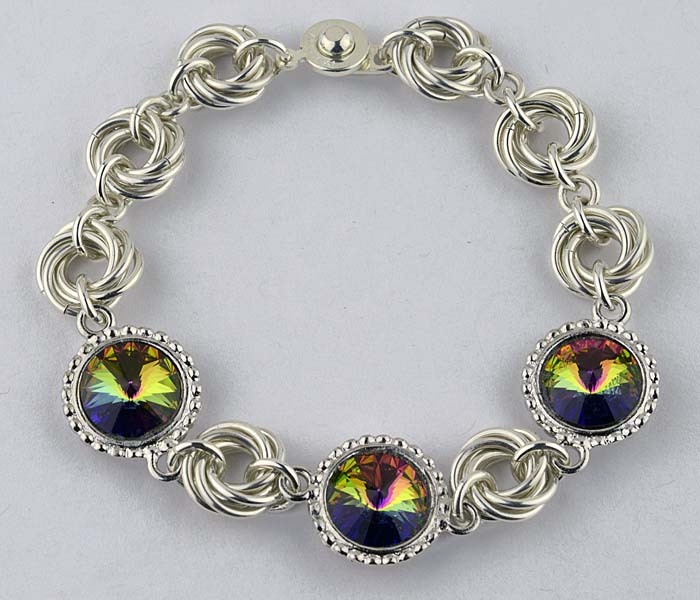 Cold connections are used by jewellers for a variety of reasons. Sometimes the materials you are using won't withstand heat because they are too fragile. 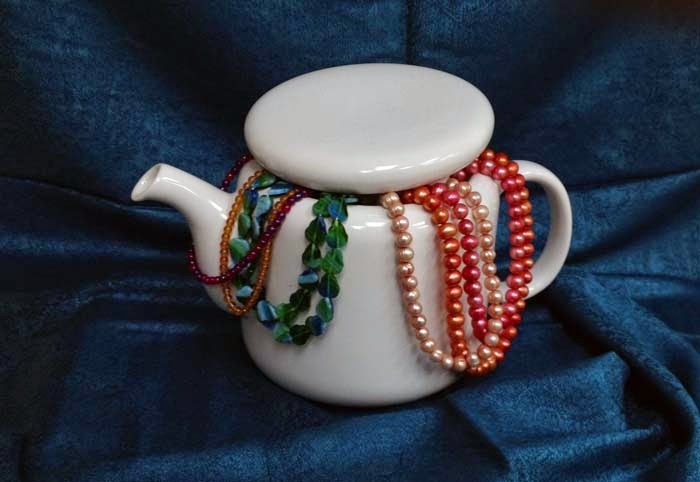 For instance, you need to use cold connections when you re-purpose old tins into jewellery, or if you are using flammable materials like leather and ribbon in your designs. Sometimes you just aren't comfortable using a torch and prefer the cold connection alternative. Using tabs and hinges can lend your design a very distinctive look. By using a tab to hold your design together, you can showcase chemically-coloured stones or fragile materials like pottery. I used a rivet to attach the metal to this ring shank, but I used tabs to secure this oddly-shaped broken piece of pottery to the metal. I might have used a little E6000 (glue) to hold it in place while creating the tabs. I love using grommets, tube rivets and eyelet rivets in my metal work. One of the main reasons is that they create negative space - a hole in your work - that can be used to balance other design elements. 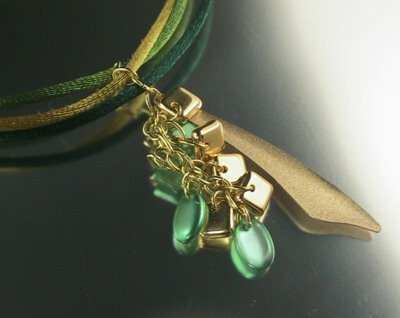 The other reason is that it creates a hole through which you can connect your piece to another with a jump ring, wire, leather, ribbon, chain, etc. 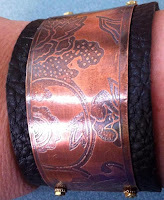 In the etched piece on the right, I attached copper to a patterned brass backing with eyelet rivets then used the holes to insert brass jump rings. With grommets and eyelet rivets, which usually come in a variety of lengths and widths, one end is usually already flared, so that's the end I ensure is on the front of my work. You just have to flare the back. There are grommet and eyelet setters for this job, or you can use a riveting hammer to gently flare the metal. I find the use of washers, heishi and other components like them helps keep the work from coming apart, especially when the rivet is being flared over a soft, malleable material like leather. Tube rivets need to be sawed or cut flush, but are more customizable to your work. You have to use a setter or hammer to flare both ends of the rivet. Twist-in micro hardware has become a very fashionable and easy way to connect metal to metal and to fragile materials. Just remember to flush cut the screw a thread above the washer then secure with a riveting hammer. 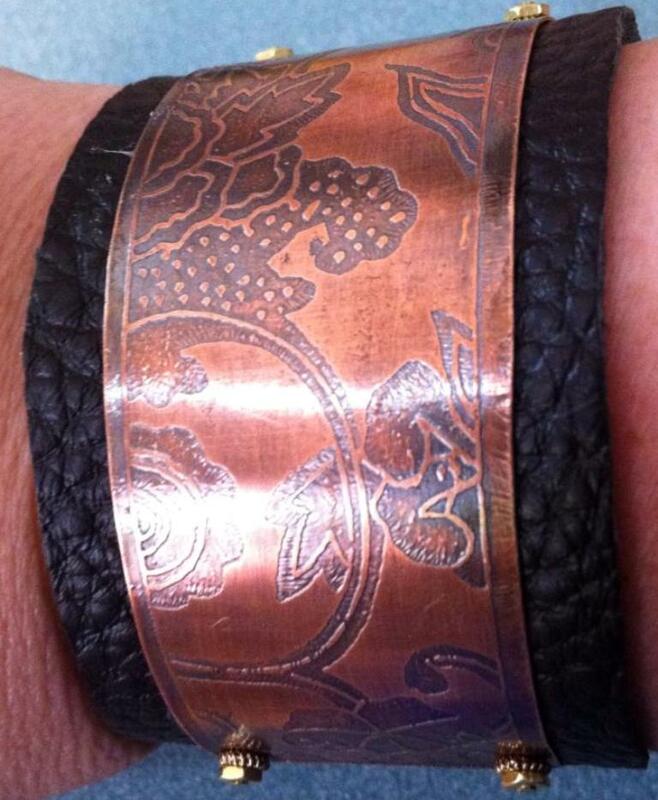 In the bracelet on the left, I used screw and nut micro hardware by Susan Lenart Kazmer to attach the etched copper to the leather bracelet. There are also cone-shaped metal pieces that have threaded screws that allow you to join two thin pieces of material together. Brads and nails are great to use in cold connection jewellery because they come in a variety of metals and already have a flush, secure end for you to work with. 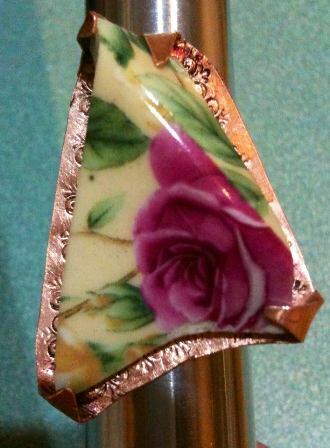 Brass escutcheon pins can be used as well. You will have to flush cut the other end and flare with your hammer. Once again, I suggest the use of a washer to ensure your rivet stays in place on the back side of your work if you are riveting metal to leather. Beadfx also has an assortment of pretty rivets that are topped with bees, flowers and other pretty designs, to add to your jewellery designs. Finally, wire. 16 gauge wire can make a great rivet. 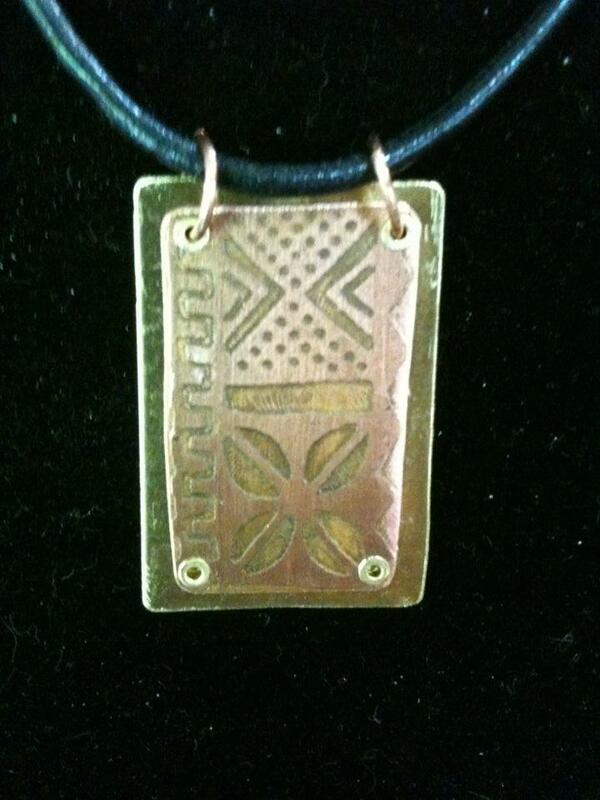 Copper is soft enough to flare easily. You need to flare the end (get out your bench pin) then flush cut the wire 1mm above your work and flare the other end. 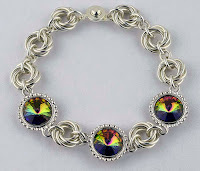 Of course, wirework can also connect your metal through weaving or even sewing your metal pieces together. 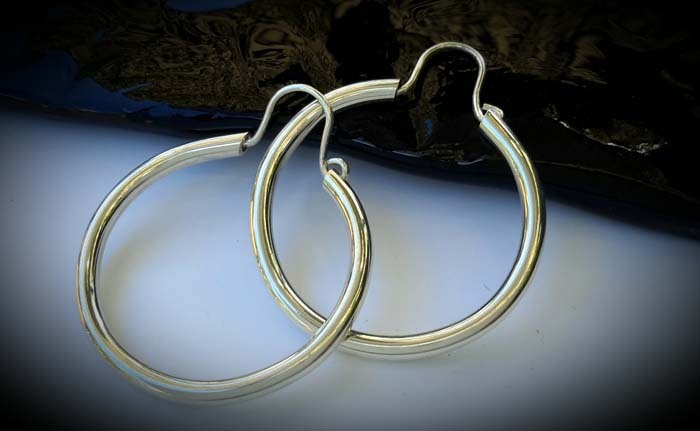 Let your imagination take flight and use several cold connections in your next piece of metal jewellery. To get you started, here's a link to an amazing tutorial by the inimitable Kate Richbourg, found on beaducation.com. And if you want a class on cold connections, let me know in the comments section -- I'm happy to design one and teach it again. Macramé is a form of textile-making using knotting rather than weaving or knitting. Cavandoli knotting (also called Tapestry Knotting) is a variety of macramé used to form geometric and free-form patterns like weaving. The Cavandoli style is done mainly using the single knot and the double half-hitch knot. Reverse half hitches are sometimes used to maintain balance when working left and right halves of a balanced piece. According to one source, the Kenyans, Ghanaians and Navajo are extremely well-known for their cavandoli-style basketwares. Macramé comes from a 13th Century Arabic weavers’ word “migramah” meaning “Fringe” This refers to the decorative fringes on camels and horses which help, amongst other things, to keep the flies off in the hot desert regions of northern Africa. Another school of thought says that it comes from Turkish “makrama” meaning “napkin,” or “towel” and was a way to secure the ends of pieces of weaving by using the excess thread and yarn along the top and bottom edges of loomed fabrics. Materials used in macramé include cords made of cotton twine, linen, hemp, jute, leather or yarn. Cords are identified by construction, such as a 3-ply cord, made of 3 lengths of fibre twisted together. 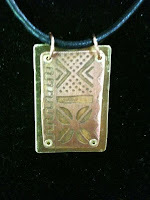 Jewelry is often made in combination of both the knots and various beads (glass, wooden, and so on), pendants or shells. Sometimes 'found' focal points are used for necklaces, such as rings or gemstones, either wire-wrapped to allow for securing or captured in a net-like array of intertwining overhand knots. 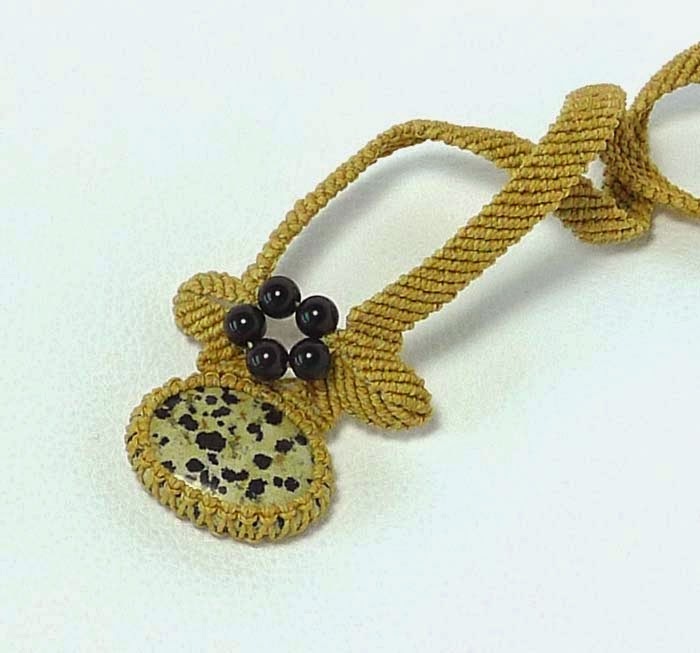 A knotting board is often used to mount the cords for macramé work and cords are pinned in place. 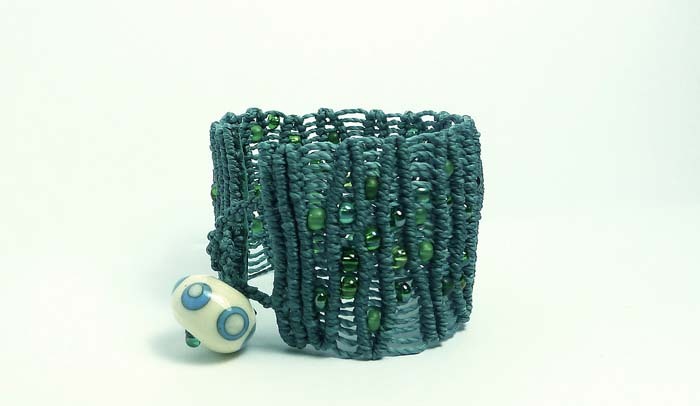 Angela Peace has taken an active interest in various knotting techniques including Cavandoli knotting. 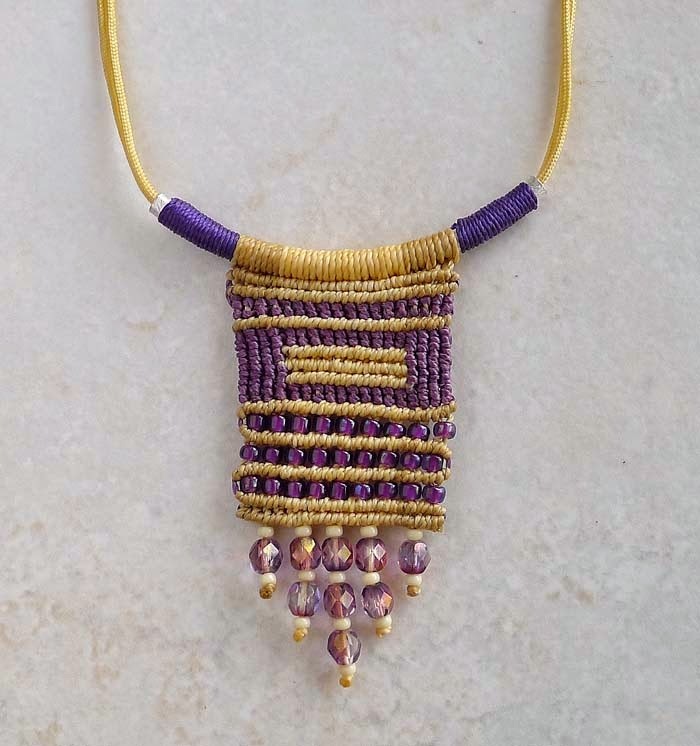 "My interest with micro-knotting techniques has been encouraged over the years by the outstanding work of Joan Babcock and Marion Hunziker-Larsen," says Angela, "both of whom I’ve been able to meet and take classes with." 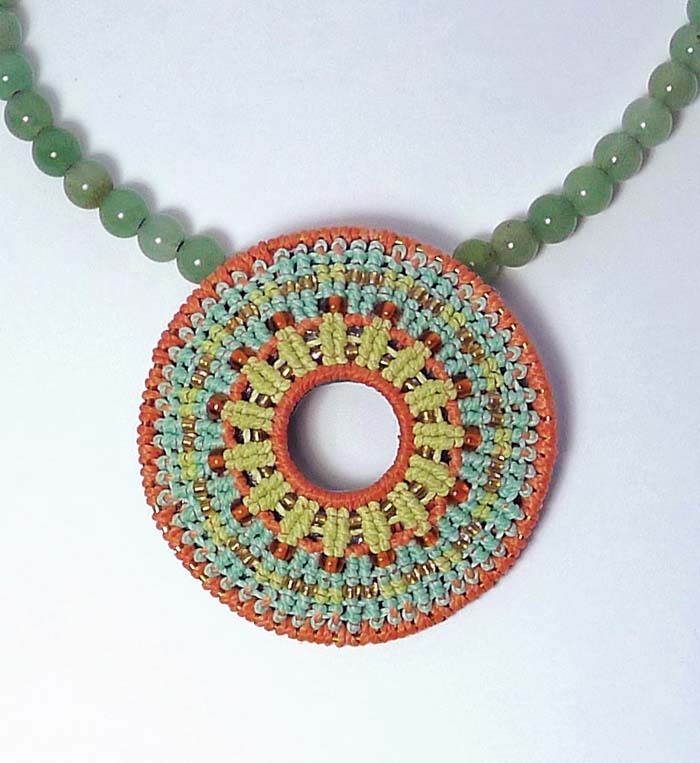 "Working with Cavandoli and micro knotting has certainly given me countless new creative options. 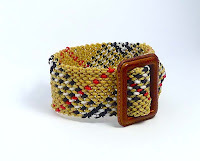 As a traditional knotter, I now get to examine my craft and find that voice which allows me to combine traditional Chinese Knotting techniques with Cavandoli and micro macrame. 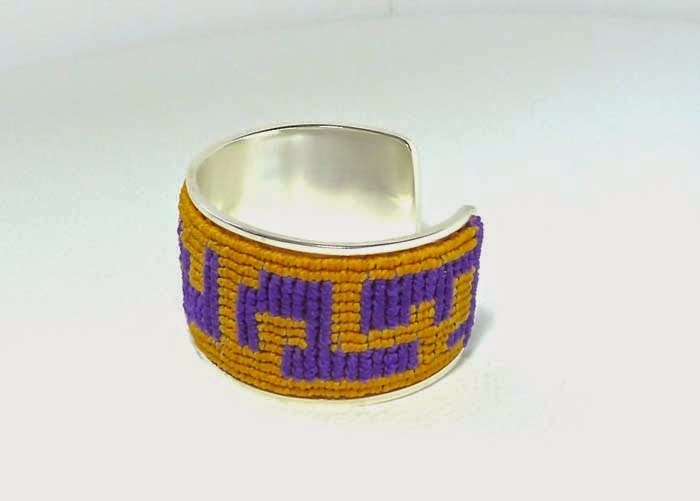 I am fully engaged with exploring new fibers, patterns and construction techniques to successfully fabricate my brand of fiber jewelry. Crafting each new technique for me is priceless, even if I have to forfeit meters and meters of cord in the process," admits Angela. "If you feel ready, to move a bit beyond your “traditional”, why not join me for a knotting class. Perhaps you too will find a new voice"
You can see each of these projects at the Back to Class event on Saturday, September 12! Please see our website for complete information about each class including course descriptions and class and kit fees. Registration for any of these classes can be made by calling the store at (416) 751-1911. The love continues - 25% off! 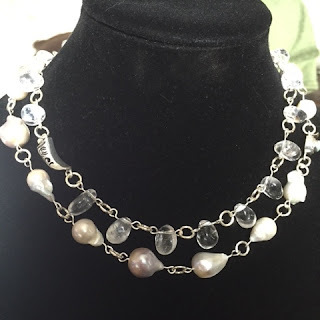 Why take a jewellery class? 2-4-6-8 -- Who do we appreciate?